DETROIT, MI--(Marketwire - February 1, 2010) - Challenging the viewer to be inspired and use their imagination is the goal of Daniel Cascardo, a nationally recognized visual artist and Michigan native, to showcase his personal style and examples of work in different art media on the newly launched Web site, www.danielcascardo.com. Upbeat rhythmic music, color photos, video clips, a gallery, shop and blog are all used to create an interactive experience for online visitors as well as to help them be entertained and to gain a feeling and appreciation for Cascardo's free flowing, abstract style. "My approach to art is to interpret life in a very positive and thought provoking manner through the use of uninhibited brush strokes, bright colors, patterns, symbols and various forms of nature, including fantastic birds and fish, that let your imagination soar," said Cascardo. Cascardo's online gallery includes a selection of street murals he created in Chicago, where he lived and worked for nine years. 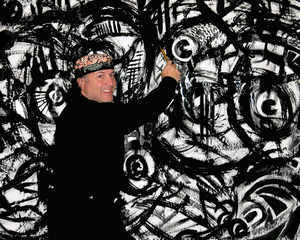 He was also commissioned to create three murals for Ferndale, Michigan, that are on display in its business district. Currently a resident of Royal Oak, Mich., Cascardo maintains a private studio and travels to a variety of locations to work with schools, corporations and other organizations to engage individuals in team building experiences through the use of art. Among the several honors Cascardo has received, he won the Starbucks Artist Recognition Award in 2006 for a mural that was created for the specialty coffee retailer's Michigan Avenue store in west Dearborn, Mich. Cascardo worked with students from three Dearborn high schools, who were directed by Wendy Sample, art resource teacher for Dearborn Public Schools. The mural was the only public art display in any of Starbucks' locations that was not created by its corporate art department. While Cascardo's art commissions can range up to the thousands of dollars, he works in a variety of media including canvas, wood, glass, and textiles. His Web site includes an online shop to purchase prints, t-shirts and other items that appeal to people who like his work and have a more limited budget. "During tough economic times, people need an opportunity to escape and enjoy artistic expression," added Cascardo. "I look forward to hearing from visitors who visit my Web site and to learning how my art can be applied to their lives." The artist's Web site was created by Design 329, a strategic graphic design and marketing firm, www.design329.com, located in Northville, Michigan. For more information about Daniel Cascardo and his art, visit www.danielcascardo.com.